Professor Woody Hartzog recently traveled to China through The Chinese People’s Association for Friendship with Foreign Countries as part of the first delegation of the Golden Key Workshop. The trip was co-sponsored by Microsoft (China). 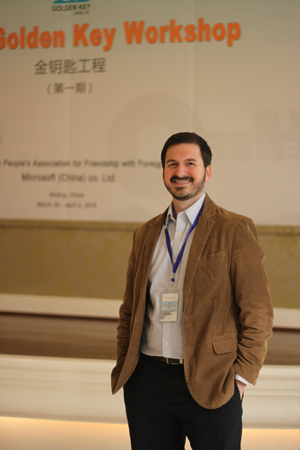 During his time in Beijing, Dr. Hartzog visited Microsoft China, toured Lenovo’s Beijing headquarters, attended lectures at Peking University on China’s Political and Social System, China’s History and Economic Reform in China. The delegation also participated in a lengthy workshop about the internet industry in China led by the Chinese deputy director at the Institute of Communication Standards Research at the Ministry of Industry and Information Technology. Other highlights in Beijing included a historical tour of the Forbidden City, the flag lowering ceremony at Tiananmen Square, a tour and dinner in the 2008 “Bird’s Nest” Olympic Stadium, and a visit to watch the China National Orchestra rehearse. In addition to time spent in Beijing, the workshop delegates travelled to the China Optics Valley in Wuhan, China and met with Optics Valley officials for lectures and tours. Near to Wuhan, Dr. Hartzog was also able to travel to Hong ‘an County to observe a special program that works to bridge multinational corporations and less-developed rural areas in China. During this visit, the workshop delegates met with local officials and teachers, observed a rural boarding school, and participated in a round-table discussion regarding the challenges fought in education and technology in rural China.